Congrats to Our CIF Champions! 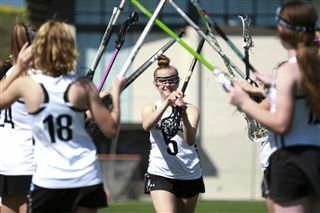 The girls varsity lacrosse game on Saturday, May 13, was perhaps the closest the team played all season. With just over a minute to go in the neck-and-neck match, the Firebirds lost their lead when Mission Bay tied the score, 10-10. Cheered on by Firebird fans packing the bleachers, junior Vivian Yun managed to score and take the lead. The Firebirds held on to the ball for the remainder of the game, knowing that losing it could lead to overtime. The crowd erupted when the game ended and the Firebirds captured the CIF Division II title.